On January 17, 1961, US President Dwight D Eisenhower delivered his farewell speech. The retired five star general had served two presidential terms and was being replaced by his fellow military veteran, the newly elected John F. Kennedy. Left-wing radicals are always quick to oppose military spending, but Eisenhower could hardly be accused of being anything like a left-wing radical. At the peak of his long military career, he skillfully commanded the allied forces in Operation Torch, which was the 1943 Allied invasion of Northwest Africa, as well as the 1944 D-Day invasion of Normandy and the Western Offensive against Nazi Germany and the European Axis powers. After WW2, Eisenhower served as US Army Chief of Staff and then as Supreme Commander of European Forces. Few Americans could claim to have anything close to Eisenhower’s military experience or expertise. He took the threat of Soviet expansion seriously. As US President, he oversaw the conclusion of the war in Korea in 1953 and approved funding for fledgling US space and satellite programs. Eisenhower also approved expensive Navy projects, such as the nuclear submarine program and the construction of the nuclear carrier, the USS Enterprise. He presided over the growth of expensive jet aircraft in the young US Air Force, and he approved funding for expensive new air defense systems for the US Army. 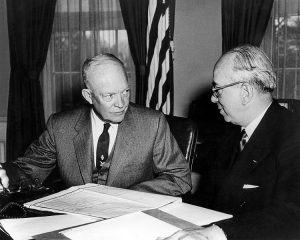 In spite of the large military budgets that President Eisenhower approved, some military and defense industry leaders saw him as being too frugal. Conversely, Eisenhower and his supporters felt that increasing military budgets threatened the economic health of the US. Fifty-five years later, the arguments over defense spending continue. Unlike during Eisenhower’s time, the arguments are now conducted against a backdrop of a frightening budget deficit and an eighteen trillion dollar national debt. The consequences of all government spending have a serious impact on the quality of life for the average American and on national security. In Eisenhower’s time, the real threat posed by the Soviet Union impacted defense spending. Today, the Soviet Union is gone, but US and European citizens are justifiably concerned by threats from various radical Islamic groups, the increasingly nuclear-equipped North Korean despot Kim, a rapidly growing communist Chinese military capability, and a resurgent and belligerent Russia. At a glance, it might seem as though a stable status quo has been in effect in military budgets. In some senses, similar dynamics have remained in force. In 1961, Eisenhower was unable to convince Western allies to commit to adequate defense spending. The allies seemed happy to let the US military and taxpayers carry more than their fair share of the responsibility for the defense of Western Civilization. In 2016, that dynamic continues. US President Obama listens to nations like France, Canada, and the UK proclaim their increased commitment to defeating Islamic radicals, but then he watches as they reduce their defense programs. Eisenhower would recognize his frustration in dealing with NATO partners. We might be tempted to assume that US defense spending itself is proportionate to what it was in 1961. Let us make some comparisons. In 1961, US military personnel were badly underpaid. In 2016 this remains true. In 1961, the US defense budget was close to 10% of GDP. Today it is below 5% of GDP. In terms of GDP, the defense budget seems reasonable enough. But let us compare some specific defense project costs. In 1961, the new Enterprise class nuclear aircraft carrier cost $451 million to build. Due to the escalated cost of construction, the additional three carriers of that class were cancelled. 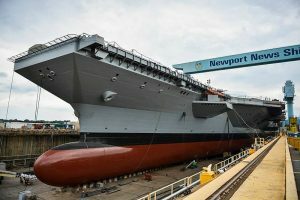 Today the new Ford class nuclear aircraft carrier is, so far, costing the taxpayers $12.8 billion to build, with an additional $4.7 billion in research costs. If we compare the two ships in inflation adjusted costs, then in today’s dollars, the Enterprise would have cost $3.4 billion to build. Where did the other $9.4 billion go? When the Enterprise was built, it included many state of the art features, but its air defense system had been scaled back to save money. The Gerald Ford class carrier includes state of the art equipment and features, but the overall economics of the two programs are completely out of scale. 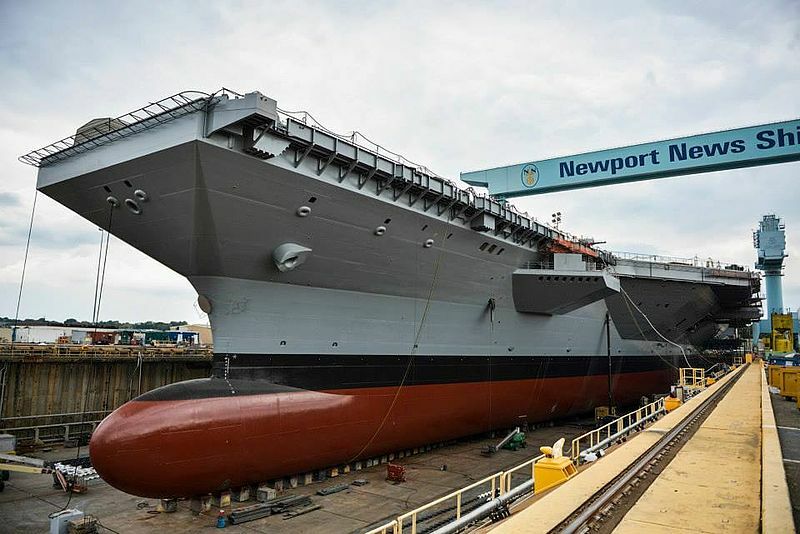 USS Gerald Ford under construction in Newport News, VA.
My question is simple. What national defense value are we receiving for the disproportionately high cost of the USS Gerald Ford? We could make similar comparisons with nuclear submarine programs, but let us instead apply the scrutiny to a broader defense project, the F-35 fighter program. 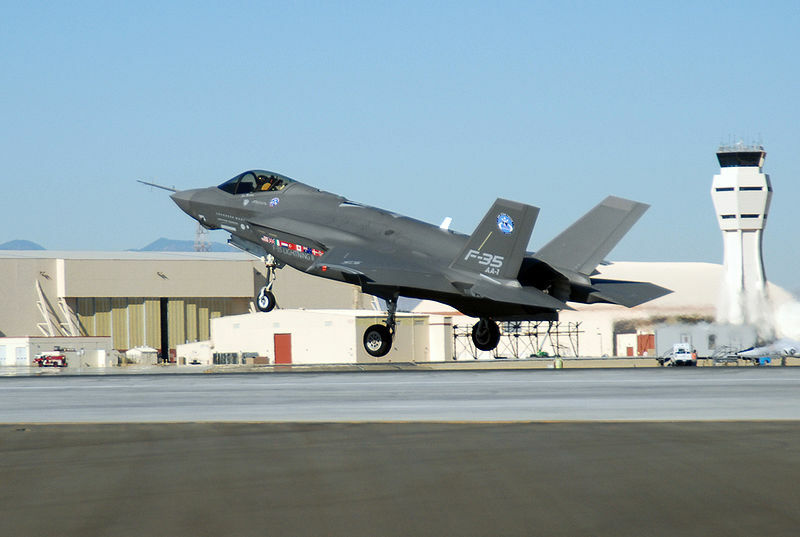 The F-35 was developed as a low cost alternative to the F-22 Raptor. So what does “low cost alternative” mean in the defense industry? The F-22 cost a frightening $150 million per plane. No wonder we wanted a “low cost alternative.” The F-35, so far, cost between $100 million for the basic model and $104 million for the VSTOL version. I’m grateful that we decided to pursue a “low cost” fighter plane. Let’s compare the F-35 to the infamously expensive Republic F-105D fighter. In 1960, the year before Eisenhower’s farewell speech, the outlandishly expensive F-105D cost $2.1 million each. In 1960, it was the state of the art fighter, and it incorporated many new technologies. 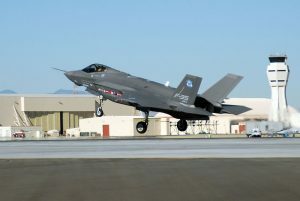 It was plagued by cost overruns, and its development was every bit as contentious as the F-35 development has become. In 2016 dollars the F-105D cost $17 million apiece. As with the Gerald Ford Carrier, the cost of the F-35 has wildly outpaced inflation. What defense benefit are we getting for the additional $80 million per each F-35? Is the F-35 going to bring us more security today than the F-105D brought us in 1960? I don’t see it. The defense industry would counter my concerns with comforting catch phrases. They tell us that it is “stealth,” and that it employs more “net centric ability” than previously imagined. For less than $100 my house is “net centric.” So how does the marvelous net centric ability account for the cost of the F-35? From my point of view, it doesn’t. Defense contractor PR players would likely question my patriotism. Am I not aware of all the real threats in the world? Do I not want the best possible defense for my family’s safety? In fact, I am very much aware of the many threats to our national security, and I do want the best possible defense capabilities for our nation. That’s precisely why I question our $100+ million fighters and our $13 billion aircraft carriers. Every dollar wasted or overpaid is a dollar that does not help our national defense. At the same time, high costs work to erode our national defense by damaging our economy. The F-35 and the Ford Carrier are only two of many defense projects that beg closer scrutiny. These high cost programs are being funded at the same time the US Marine Corps is undergoing a 30,000-man reduction in force. The Pentagon and the White House tell us that we are more committed than ever to fighting the increasing terrorist threats, so how is it that we justify large cuts in our premier expeditionary force? The numbers just don’t add up. In some cases, they don’t come close to adding up. President Eisenhower’s words are even more appropriate today than they were in 1961. Think twice before you quietly accept every extravagant defense expenditure. Let your congressmen know you are watching.